Belo Essentials is now also starting to add more whitening products to their range. The newest is Belo Essentials Papaya soap. 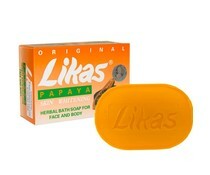 This soap is made from natural papaya extracts. Belo Essentials Papaya soap 135 GR. Belo Essentials has brought a new product on the market again. Belo Essentials Papaya soap is one of them. There are already a lot of papaya soap on the market. What is deer difference? Belo Essentials Papaya Soap is made from natural papaya extracts that help you get a clear, smoother and clearer skin. It also exfoliates the skin with its jojoba pearls and even helps to remove pimples with the Beetox. It has been expertly formulated and tested dermatologically. Also try the Belo Essentials Papaya Body lotion for a better result.